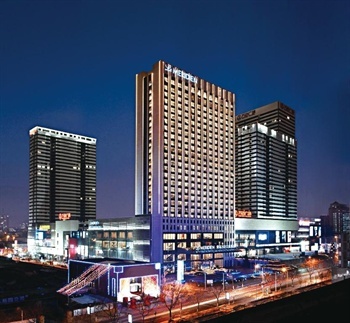 Le Meridien Qingdao (Qingdao Wanda Aimei Jiudian) is located in Qingdao's new Central Business District, within easy reach of shopping malls and office buildings. It is only a ten-minute drive from many local Qingdao attractions. Guestrooms are designed in an elegant, cutting-edge style with a sophisticated flair. The variety of rooms are equipped with international direct-dial phones, mini bars, in-room safes, Internet access and many other modern amenities. The Meridien's restaurants serve authentic international cuisine in its grand banquet halls and dining rooms. Guests have the opportunity to try Japanese, Western, and Chinese cuisine and can relax in the lounge with a variety of drinks. For business travelers, this Qingdao hotel offers a board room and six various-sized meeting rooms, which are suitable for banquets, conferences and seminars. A business center is also available for guests' use. Guests can enjoy a host of recreational facilities. The spa is a great place for a bit of pampering. The gym possesses state-of-the-art equipment for guests to use, and there is also an indoor pool to take a quick swim in.